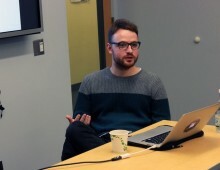 On April 4, 2016, the NYU Jordan Center for the Advanced Study of Russia welcomed Ilya Matveev from the European University in St. Petersburg for a lecture titled “Austerity and nationalist mobilization: reflections on the Russian crisis.” Rossen Djagalov, Assistant Professor of Russian and Slavic Studies at NYU, introduced Matveev by highlighting his multiple contributions to Russia’s intellectual and social life. Matveev is the editor of OpenLeft.Ru, a member of the PS Lab research group, a lecturer in political theory at the North-West Institute of Management (Petersburg), and an activist in the University Solidarity trade union. The scholar started his talk by highlighting similarities in the ways different countries deal with economic crisis. “Most governments in the world, they do basically the same thing,” he said, highlighting how the burden of any crisis is normally placed on ordinary people. Crises also represent opportunities for imposing unpopular measures, since under those circumstances the population is too disoriented to protest. Matveev associated these traits with the liberal age as a whole, but noted that there are some peculiar features that distinguish the Russian case. In particular, he highlighted the specific dynamics regulating trends in Russian economy, dispelling the generalized belief that there is a correlation between oil prices and Russia’s economic growth. In fact, Matveev said, an analysis of trends over time shows that even when oil prices are low, Russia can still experience considerable growth. This was the case in 2000 – when “the ruble became cheaper, exports became more profitable and in this way, the whole economy had such a huge boost.” And even though in the following years economic growth did go hand in hand with high oil prices, “the crisis of 2009 demonstrated that this whole economy is actually more like a house of cards, because it was very easily destroyed.” In the five years following the crisis, the correlation was yet again disproven, as the economic slowdown continued in spite of high oil prices. Matveev said that the low performance in international financial markets, dependence on foreign borrowing by corporations, and structural weakness explain Russia’s continued state of economic stagnation. “We have a huge public sector but it does not produce growth, it is not a driver of growth,” he said. “[The] private sector also does not produce growth. It only produces capital flight, which increased dramatically after 2009.” Economic sanctions worsened the situation, affecting the GDP and instigating extreme social consequences for the population. “No one actually knows when the economy will bounce back,” he added. In response to the crisis, the government introduced austerity measures similar to those imposed upon Greece, freezing and adjusting pensions below the inflation level, imposing housing capital repair fees and fees for long-haul truck drivers, and increasing gasoline excise duty. Russia also experience public sector cuts; in five years, eight percent of public sector jobs were cut and in 2014, 90,000 healthcare jobs were eliminated. Matveev turned to ideology to explain the government’s decision to enforce austerity measures. He said that there is a very direct connection between the cuts and the neoliberal restructuring of welfare, which has been the main vector of reform in Russian since 2000. Matveev also discussed Putin’s popularity in Russia, offering a nuanced analysis. He noted that popularity surveys cannot be entirely trusted because they are inherently biased towards those who support Putin. “A lot of people who don’t support Putin, they simply refuse to respond to the survey agencies,” he said. He also observed that there is a correlation between the economic situation and Putin’s approval rating. This was noticeable in 2008, when the approval rate peaked at 85 percent and then began to gradually decline. Even during Putin’s third term, which has been characterized by a rhetoric focused on conservative, nationalist and traditionalist motives, his ratings have continued to fall. Matveev said that only one thing seems to have had a positive effect on Putin’s popularity – the annexation of Crimea. “It was an event that completely reversed [the decline] and provided this extreme boost in support,” he said. To Matveev, Putin’s regained support following the annexation of Crimea and intervention in Ukraine the “rallying behind the flag” effect. This model also explains the siege mentality and rising tide of conspiracy theories that have become characteristic of some segments of the population. The scholar noted that such trends have become a welcome development for Putinism, since they paralyze the population into inaction. “All you can do is to educated yourself on all those evil people and organizations that hurt your country and rely on Putin as this mythical force that can stop the conspiracy that exists against Russia,” he said. In the final part of his talk, Matveev discussed whether the crisis can eventually lead to more frequent protests. He noted an increase in the number of work protests, including informal strikes, and inter-regional campaigns coordinated by trade unions, but noted that they have not yet become as widespread as in countries like Greece. Matveev concluded by mentioning the lack of coordination between the political opposition and social protesters, particularly when public sector employees are staging the demonstrations. He explained that political activists often see public sector employees as a lost cause and “Putin’s faithful servants” and therefore shy away from supporting them. Still, Matveev believes that there is nothing that would prevent the opposition from linking social and political demands. In the Q&A session that followed, NYU Jordan Center Director Yanni Kotsonis discussed the correlation between economic turmoil, apathetic attitudes among the Russian population and the low voter turnout. Taking questions from the audience, Matveev was also able to expand on Putin’s appeal among the U.S. Republican circles, the role of oligarchs in limiting Putin’s authority and former Minister of Finance Alexei Kudrin’s resignation as a symbol of how the commitment to defense is prioritized over neoliberal policy in Russia.